Teresa: please e-mail to Tess below (Terese Umbras Fehlberg) as soon as you can. Dear Olga, I have stumbled on your website as I was looking up info on Brauweiler. I am now wondering if there is another web where I can make inquiries about that former DP camp? I spent a few very difficult months there end of 1948/early 1949; part of the camp was a 15th century ex-monastery, the other part was a former jail building. With few exceptions (about 30 Hungarians, like me, a few Yugoslavs and Balts) the camp was predominantly Polish. Thank you. 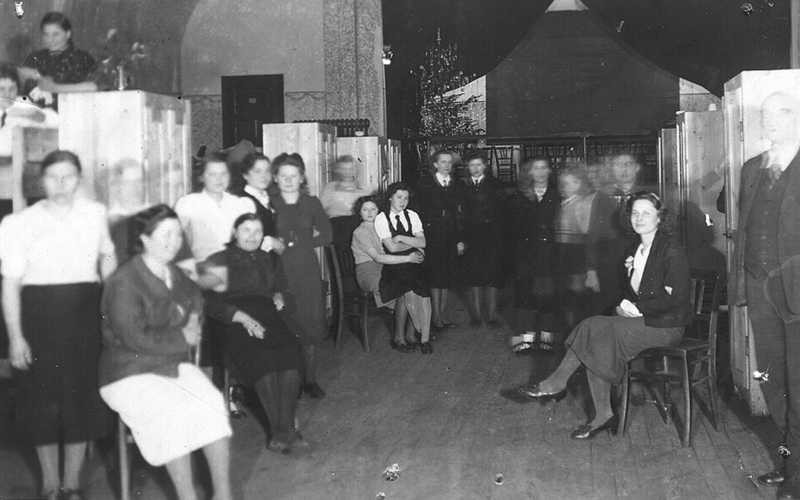 I believe these photos are taken in the Brauweiller camp or in Dusseldorf (around Christmas time, because of the tree) which I can only assume is 1945 (due to another picture of my mother in the same dress which she used as a postcard and dated 1945 on the back) and the other of two women most likely 1948. 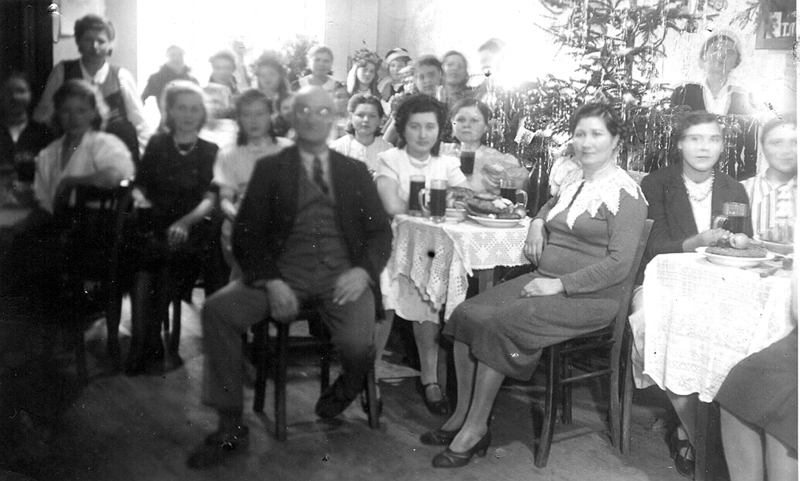 My mother Irena Leokadia (Lydia) **Krasowska (actually Dudnik) and my grandmother Maria Krasowska (actually Dudnik nee Rindzina)are sitting at the table with the gentleman with glasses. They were 19 and and 38 years old respectively. **Krasowska was the name of my babushka's second husband, Florian. The costumes in the forefront are Ukrainian. 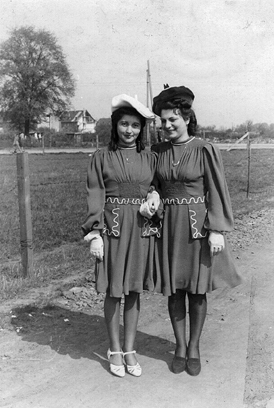 I looked up the Belorus costume site www.kresy.co.uk/belo_costume.html which shows historic regional dress but they do not really bear a close resemblance to the simple everyday pieces that the girls in the photo are wearing. Mum and Gran were Ostarbeiter (east workers) but according to my notes they were taken late in 1941 whereas history seems to say that the first train out of Kiev of "volunteers" went on 29 Jan 1942. 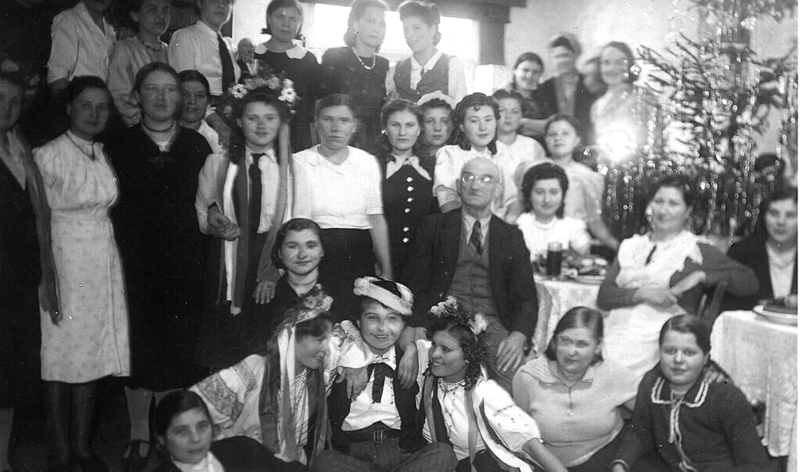 They were from the Voroshilograd (Lugansk) and Yenekieve region but had resettled around Kiev in the 1930s. To appear "Polish" they claimed to be from Rohatyn. Many Ukes spoke Polish as well and sometimes exclusively, even if they were ethnically Ukrainian, simply as a matter of assimilation it seems. My Mum and Gran managed because Mum could think on her feet, already spoke schoolbook German, a little English, and learnt simple Polish from her contact with Poles and Polish-speaking Ukes. Gran kept her mouth shut. Close up photo shows my mother and babushka. This photo is taken in the same hall. This Christmas celebration was no doubt sponsored by the UNNRA. The tree was probably cut from a nearby forest outside the camp. This is my mother and a friend whom might be Julia Kolodziejska, which would have been around Brauweiller/Köln area. My mother married Bronislaw Umbras. Thank you so much for this site! My Polish grandmother was in Brauweiler from 1945 - 1951. She said she used to work in the "English Casino" which she translates into a "cafe" in the kitchen. She's told us many stories of her time in the camp, and your site has really put it more to life! My mom was born there as well as 2 other uncles. I am wondering if anyone has any more pictures of the camp or may have any similar experiences. The Godmother on my mother's baptismal certificate is Josefa Augustynowa and Godfather Antoni Lucjanek. Conference on concentration camps mentions Brauweiler concentration camp, in German. Addresses are on this page. Forced labor in Köln, in German. Use Babel fish computer translation to help you read it.